The ALS Ice Bucket Challenge made popular during the summer of 2014 has come full circle. Can you believe it’s been two years since we were all dousing ourselves with buckets full of water and ice? Big buckets, small buckets, various proportions of water and ice, toddlers and grownups alike – even celebrities were doing it. And there was no avoiding it; it was only a matter of time before each of us got challenged to do it. And while we were all partaking in this challenge, it was being captured on video and posted on social media sites. It was a true viral phenomenon, all in the name of ALS (Amyotrophic Lateral Sclerosis), more commonly referred to as “Lou Gehrig’s Disease”. If you’re like me, you were probably thinking: “Okay, I guess I’ll try it. But how in the world can pouring ice water on my head help find a cure for ALS?” Ludicrous, right? 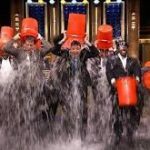 Now, two years later, we see that not only did this ice bucket challenge create a heightened awareness about this tragic and fatal disease, but donations and funding increased enough to enable researchers to make a dramatic and important discovery. What’s more, one of the key scientists responsible for this discovery is from our very own UMass Medical School – right here in Worcester! How cool is that? This underscores the power of social media. Sometimes the power can work against us, but often, it works for us and gives us hope for the future.